It was with a great sense of foreboding that I set forth on the quest to fit the bow end of the port garboard plank. Tales of woe, misery, and giant squids climbing out of the anchor well and throttling the unwary sailor abound on the high seas. Actually I was getting a little carried away there with the bit about the squid. I'm rather partial to squid for what it's worth, especially fried with salt and pepper and some lovely fresh chips. And whilst there is a (vanishingly remote) possibility that one could make it the fifty odd metres from the ocean (what's that in leagues?) to lurk in my anchor well, it's pretty likely my trusty guard cat Mogget would get the thing well before it took up residence. Not to mention that until I've finished planking, the anchor well isn't, well, a well. Where was I? That's right, I was pointing out that whenever you read blogs describing the building of navigators, there's always a lengthy description of how awful it is to pull the garboard plank around to sit nicely on the stem. So I approached the task with, as it happens, considerable trepidation. And foreboding. Did I mention foreboding already? The process starts the same as all the other planks. I put a length of ply in place, mark it with distances, and use that as a template to cut the real thing. I left it a little oversize, particularly at the front. Then I clamped it to the plank immediately aft and progressively pulled it into place, mainly using pusher clamps off the building frame. Here's the crux of the problem that everyone has. The plank doesn't want to pull neatly around the foot of the stem. I solved this problem by going at the foot of the stem with a spokeshave, and using a clamp right at the back of the stem to pull the plank the rest of the way in. Then I ruled a line for the stem on my plank and cut it much closer in size. Here it is on test fitting eleventy of lots. You can see that there aren't actually all that many clamps involved to hold it in place. when you get the bow in, much of the rest of the plank pulls up hard. Once satisfied with the fit I gooped it up with a truly heroic amount of epoxy and put it back on. This time I used a few more clamps to make sure the joins are all nicely closed. I'm really glad I put the king plank and inner gunwales on before doing this. The bow is as solid as a rock, and didn't pull out of true at all. Here's a view taken from the bow just to satisfy myself that the boat is still straight. I really like the curve this plank makes. Very cool. Note the clamp on the opposite side of the building frame from where I'm working. This ensures the frame doesn't pull too much out of true. Finally here's me getting an even coat of epoxy in my hair, whilst cleaning up the fillets deep in the bowels of the beast. Wear a hat Suzy. I have to wear one because I will hit my head every time I work on my boat and wearing a hat seems to provide some sort of protection. No problems with epoxy in my hair because I have none. Soon you will have your boat planked. The hardest one is the one you just did. Incredible neatness... Still don't know how you do it. Keep doing it. 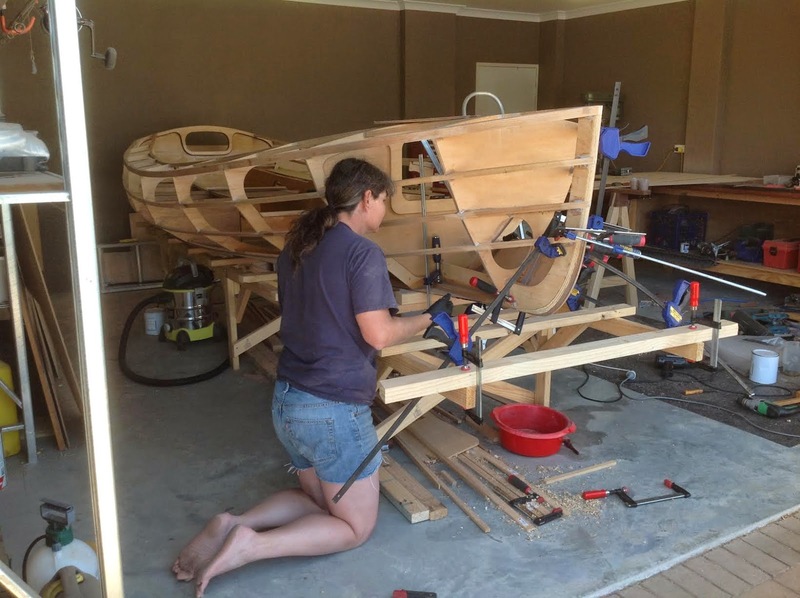 Hi Suzy, Wow it's really starting to look like a boat and a hand crafted piece of art. Looking forward to seeing it in the flesh one day. Enjoy the build, talk soon. Just as an alternative to Joel's comment, you can also use rolling bevels for the bow planks. They are a bit less "scientific" to cut, but they are not that hard to do with a small plane, just eyeball/measure things, plane one bevel in, then plane the mating piece to fit. I have a short post on how I accomplished them at http://donumvitae.wordpress.com/2010/10/11/rolling-bevels/. I agree with the other posters: you are doing a fantastic job. You will have a gorgeous boat when you are done.